I truly do love the PSP. So many great gaming moments over the year, with games like none other (Loco Roco, patapon etc). There's still so many JP only games i'd still love to play, and thankfully they're not that expensive to import. Hey there, Franggio! RE: your comment about your backlog burying you--you and me both! As for The Legend of Heroes series: I'm guessing you'd have me start with Trails in the Sky? I loved the PSP, but man do I ever hate the UMD format. I bought several games for it and then bought my library again as digital downloads when the PSP Go was released. I keep hoping Square Enix will release a legit download version of Crisis Core so I can complete my library's move to Vita. PSP was also my media player of choice for a long time, since movies look great on that screen. But yes, Trails is wonderful. So many great NPC'S!! I don't often really care for NPC's in games as they often don't offer anything more than one two lines but in the trails games they are like a fully fleshed out characters and mentioning Characters. Estelle Bright - person of all the years! Ah, now you've got me intrigued, Franggio! Of course, it's not like I haven't heard great things about Trails in the Sky before now, but it's always better to hear such things from people you actually know--or at least that's my belief! Huh, what is it about the UMD format that you don't like, Terry? The large-ish size? The loading? Something else? My biggest gripe with the PSP is that I don't really like either of its main inputs for the left hand--i.e., the d-pad or the analog nub. Neither feel very comfortable to me, so for many games I feel like I'm fighting those inputs in order to enjoy the game. Been going back to playing some PSP myself. Ever since I got one, I've been trying to see what I can find that entertains me. I actually have found a few masterpieces like "Jeanne D'Arc" and "PoPoLoCrois" and "Half-Minute Hero". I'm limited to what I can find locally sadly, but I have no regrets! Hmmm, I think I'll stick to the English release(s) for this series for the time being, Franggio--with the possible exception of Nayuta, I mean. Although that's supposed to be more of an ARPG, right? Which is more acceptable to me in terms of playing through it in Japanese. Hey there, Motherplayer! Ah, so you like the PSP port of PoPoLoCrois? I've been meaning to nab that one forever based on what I've read about the PS1 originals, although I know some folks really don't like how the PSP version was altered. Of course, I have no experience with the PS1 games, so maybe those things won't matter to me? Yepp, a great one to boot. Yeah, I know Falcom isn't the best when it comes to graphics, but that's OK with me as long as the overall art style is nice, which seems to be the case with this series. UMDs were large and (on my model, at least) kinda loud when the machine was accessing the data. They also felt overly delicate because of the disc-read window on the bottom. 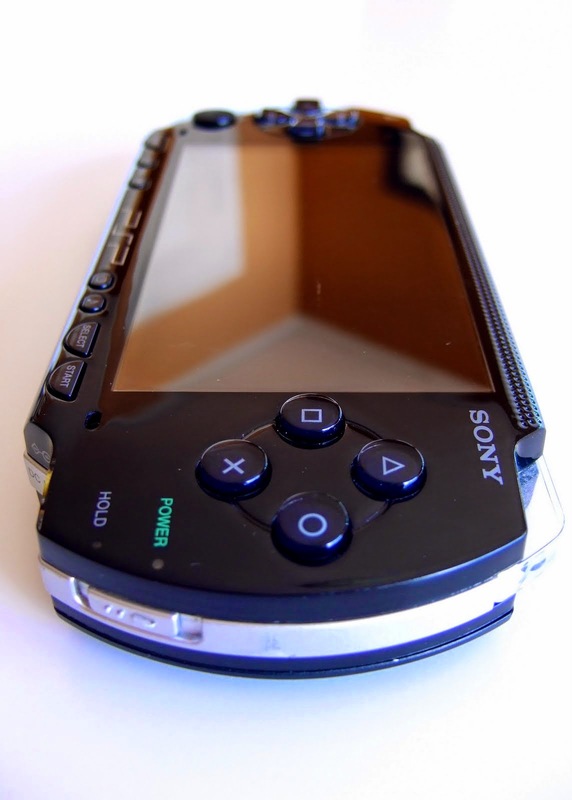 I preferred the PSP Go because it took care of that problem and, with the right cables, could be connected to a TV and paired with a Dual Shock controller via Bluetooth to create a mini-console. Oh, yes, they're definitely loud, Terry. I've always found it pretty weird to hear a portable system making the kinds of sounds the PSP makes, actually. As for the PSP Go, I've long liked its design. Unfortunately, I've also long been unwilling to buy one due to the fact that doing so would require me to buy the digital versions of all of my UMD games if I wanted to play them on the system, and that just ain't happening at this point. The PSP and DS are what got me back into gaming after giving it up after the 16 bit era. Ultimately Peace Walker (the UMD that finally broke my UMD drive, leaving me with me a defacto PSP GO) Loco Roco, The Capcom Classics collections, especially for Ghouls n Ghosts), PataPon is one I always wanted to like but never got into. I loved Jeanne D'arc, but I somehow overpowered myself partway through the game. I was so powerful that I no longer needed to think tactically to win so I gave up on it. But I still have fond memories of it. Mega Man Powered Up was all right. I've really warmed up to the PSP since I got the 3000 a few weeks ago. Great system; anyone who whines about the screen is nuts, because 2D games look dazzling on it. Play one of the Street Fighter II games on Capcom Reloaded... you'll have to pick your tongue up from the floor because it's so gorgeous. The UMD format is a bummer, but that's easily ignored if you've got a decently sized memory stick. One of the nice things about this system is that there's an adapter that lets you use Micro SD cards, making the price a non-issue. My favorite games have been classic collections, with the obvious exception of EA Replay. Who told these chumps they could make a classic collection, anyway? Burnout Legends is also terrific. Generally speaking the PSP is awesome for racing games. I've been spending time with Valkyrie Profile and there's a lot I do like, but the fact that I'm stuck in the first dungeon has got me a little cranky. The map (which they insisted on rendering in 3D) really isn't helping much. Oh, you won't hear me complaining about the PSP's screen, Jess. I love it! Of course, I've only played games on a PSP-1000, so who knows what I'll think of the PSP-3000's screen, should I ever nab one of those? You've reminded me that I really have to get a couple of the collections/compilations released for this system, by the way. I especially want some of Konami's (Japan-only ones), but the Namco and Capcom ones sound really nice, too. PSP and DS were such a great pair of systems, maybe my favorites. I picked it up on the US release date, March 24th, 2005, my 24th birthday! It doesn't seem so long ago! My friend and i stayed up all night, picked up the PSP (along with Lumines and i believe Darkstalkers) and got a Shamrock Shake at McDonalds. Well, the PSP didn't make me ill so that was the better part of the day. That screen was so vibrant! I remember just playing Ridge Racer and thinking how great it was. I also remember pouring hours and hours into Hot Shots Golf. The weird thing is that i don't think i've ever actually finished a PSP game, except for the port of Ys, which i only finished on Vita. I'm not sure why that is! What great memories, finchiekins! I love that you remember getting a shamrock shake after picking up your PSP :) Don't feel too bad about not finishing many PSP games, by the way. I've only finished a handful myself!